Hellooooooooo Monday! I’m excited about this upcoming week because my mother is coming to visit California for the first time! I’m beginning to plan her trip but honestly we will mostly sit by the pool and catch up. I haven’t seen my mom since April, the day after our wedding, so this trip is well overdue. I’m also excited to share this new collab with Meaningful Beauty. 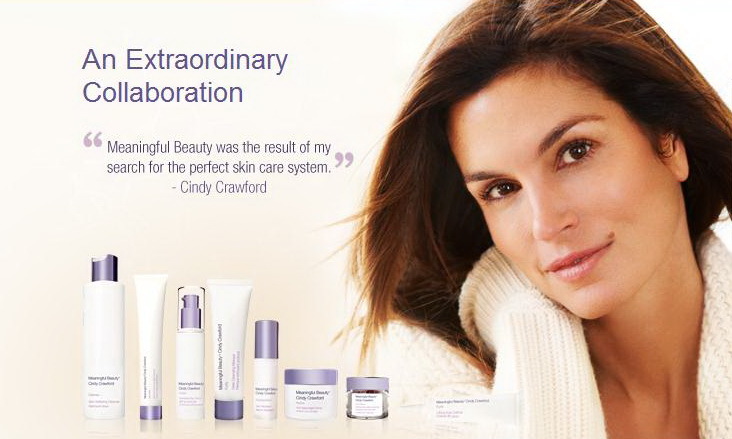 No on can deny Cindy Crawford is a goddess….the woman seriously doesn’t age. I recently used one of Cindy Crawford’s product, the glowing serum to be exact, and man oh man am I a believer! My skin instantly felt rejuvenated and my face actually GLOWED! Now you can win a celebrity VIP treatment with Cindy Crawford’s personal glam squad. (WHAT! I’m jealous I can’t enter)! Cindy believes everyone has their own “red carpet moment” and should have the opportunity to embrace it as a celebrity would. Whether it’s an anniversary, wedding or birthday, Cindy’s glam squad is guaranteed to give the lucky winner a head to toe VIP beauty treatment – from hair to makeup to fashion and beauty tips from the Hollywood experts. To enter the contest, fans must submit a short description with a photo or video testimonial through Meaningful Beauty’s Facebook page, detailing why they want to win the VIP experience. The winner will work with Cindy’s team to transform their special occasion to an unforgettable day of beauty. You can simply record a little message on your iPhone, it’s that easy!!!!! The contest will end on September 30th at 11:59PM (ET). It enter to win my giveaway-follow my Instagram account, like the picture and answer the question: “I want beautiful skin because _______!” Have fun with it! I’ll reveal the winner next Monday. Disclaimer: If you do not have an Instagram account you will not be penalized- just answer the question underneath in the comments. Tags: beauty, beauty blogger, Beauty expert, beauty products, california, Cindy Crawford, contest, Facebook, facebook contest, giveaway, Meaningful Beauty, orange county. Bookmark the permalink.